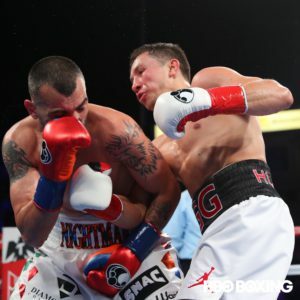 In what was originally supposed to be a pay per view broadcast superfight, HBOs Saturday boxing card showcased Gennady Golovkin against Vanes Martirosyan for middleweight supremacy. Golovkin was originally scheduled to face Canelo Alvarez in Las Vegas in a rematch of their high profile and controversial first match last fall. Canelo was popped with Clenbuterol in his system, however, and the fight was scrapped. Junior middleweight Martirosyan stepped in for Canelo, however, and the fight was moved to the StubHub Center in California. Before the main event, however, viewers were treated to the first women’s boxing match ever aired live on HBO. Longtime welterweight champ Claudia Braekhus, 32-0, faced Kali Reis, 13-6-1, in a ten rounder. The first half of the fight saw the established champ jabbing her way to what appeared to be a comfortable lead. Things got interesting in the 7th round, however, when Braekhus was dropped by a Reis right hand. Braekus looked effective in the 8th, but was rocked again at the end of the round. By the ninth, the fight had gone from one sided to competitive. Braekhus may have dominated most of the fight up until that time, but Reis’ assertiveness and power left a question as to how the bout might end. Reis battled gamely in the tenth, but so did Braekhus, which mean Reis was unable to close the show before the final bell. Braekhus ended up taking a unanimous decision win. It was an entertaining premiere for women’s boxing on Home Box Office. It was time for the main event. Martirosyan, 36-3-1, was first to enter the ring, followed by the champion, Golovkin, 37-0-1. Both fighters looked intensely focused in the moments before the bout. The first round was an active affair – one Martirosyan, who was punching sharply, may have won. GGG tagged his man hard early on in the second. Martirosyan had his moments, but at around the halfway point of the round, a frightening display of punching power from Golovkin put the game Armenian warrior down and out. “I feel great,” Golovkin said after the bout.